1821 production of Aladdin, a 'Grand Melo-Dramatic Romance in Three Acts', at the Leeds Theatre, Hunslet Lane. The earliest known production of Aladdin in Leeds (in 1821) emphasised its Arabian Nights origin and possibly middle-eastern setting. By 1826, however, it had become a mashup of Chinese and Turkish settings. 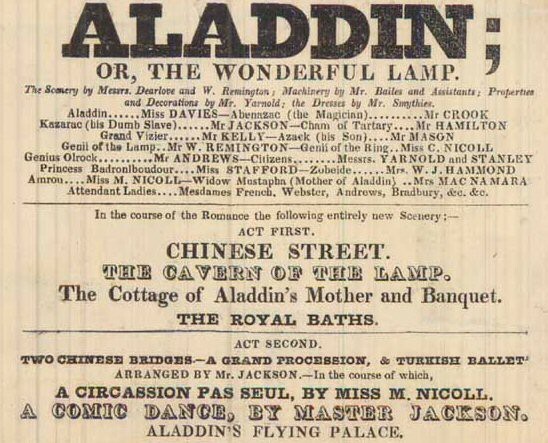 1826's Aladdin at the Hunslet Lane Theatre - now a 'Grand Oriental' romance. A 'striking Representation of the Chinese mode of Defence & Attack' given by Monsieur Decour at the Theatre in Leeds in 1830. The 1830s saw Chinese processions and martial arts as grand spectacle on stage and in the circus ring. 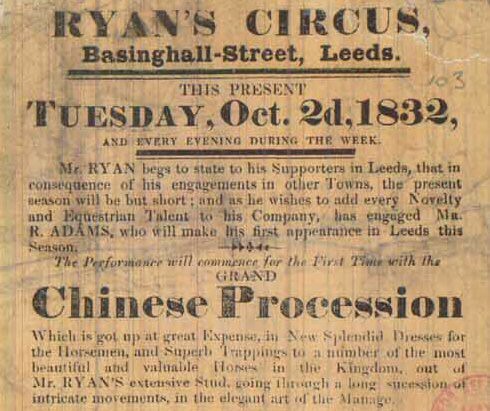 Ryan's Circus, which visited Leeds in 1832, included a Grand Chinese Procession 'which is got up at great Expense, in New Splendid Dresses for the Horsemen, and Superb Trappings to a number of the most beautiful and valuable Horses in the Kingdom'. 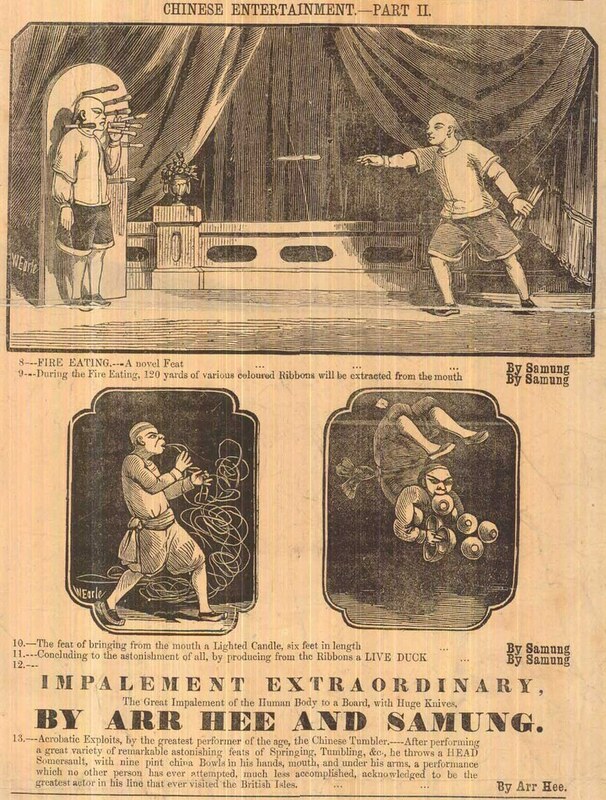 Chinese entertainments at the Victoria Hall in 1862, including 'the Great Impalement of the Human Body to a Board, with Huge Knives'. 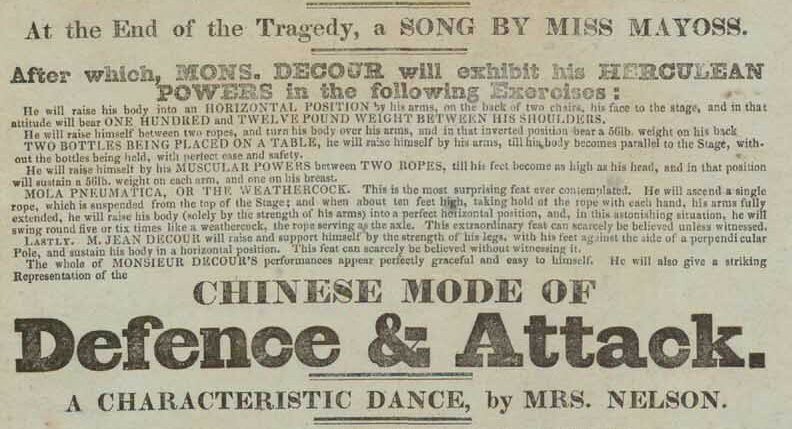 During Victorian times, gruesome and nail-biting acts 'direct from China' took centre stage in Leeds, but a certain reverence was shown for the country's Emperor. 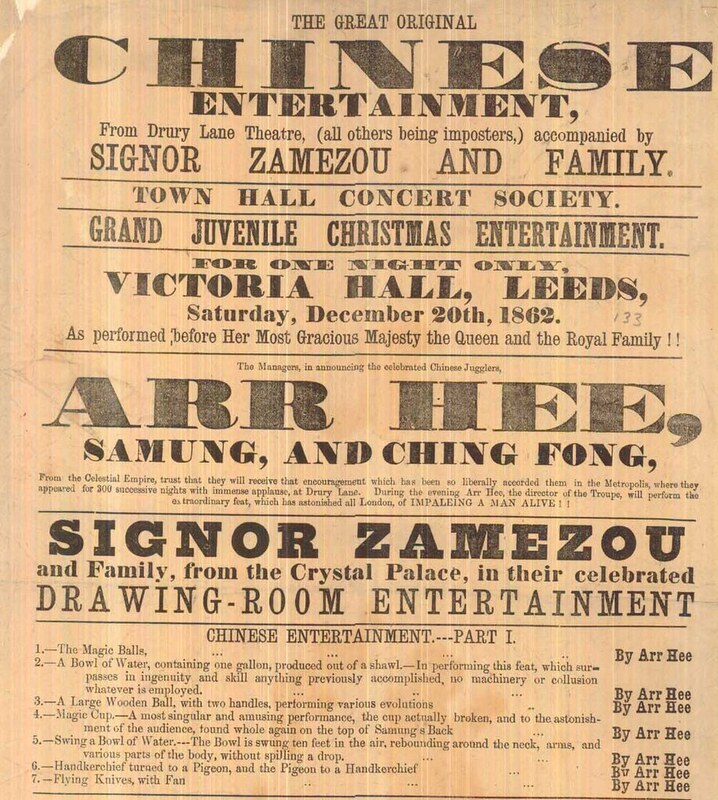 Chinese entertainments at the Victoria Hall in 1832, performed by Arr Hee, Samung and Ching Fong. 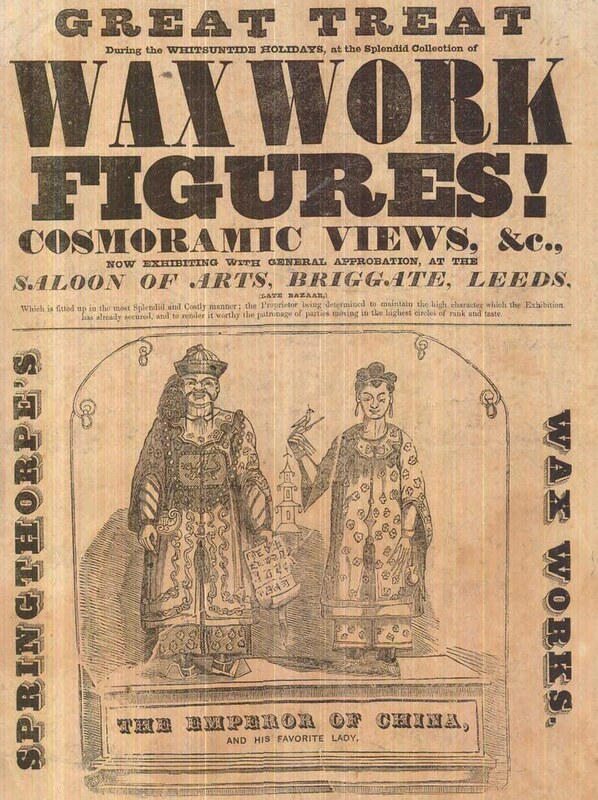 At the Saloon of Arts on Briggate, waxwork figures of the Emperor of China and 'his favourite lady'. 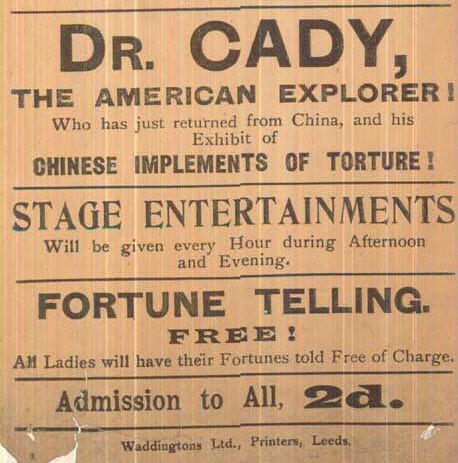 American explorer Dr. Cady exhibited 'Chinese implements of torture' at Unzie's Palace of Living Novelties in the Tiger Buildings, Kirkgate. 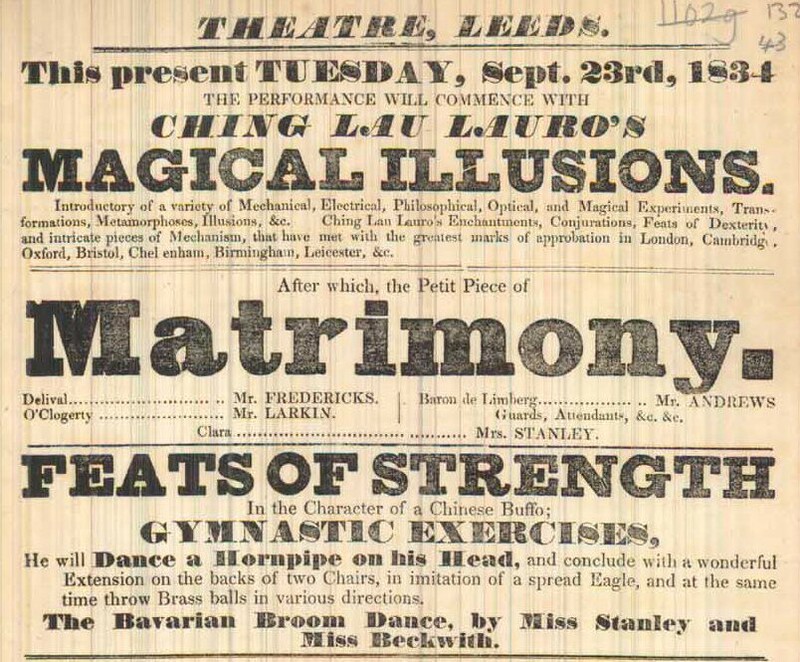 Feats of strength performed by Ching Lau Lauro at the Hunslet Lane Theatre in 1834 included dancing a hornpipe on his head. 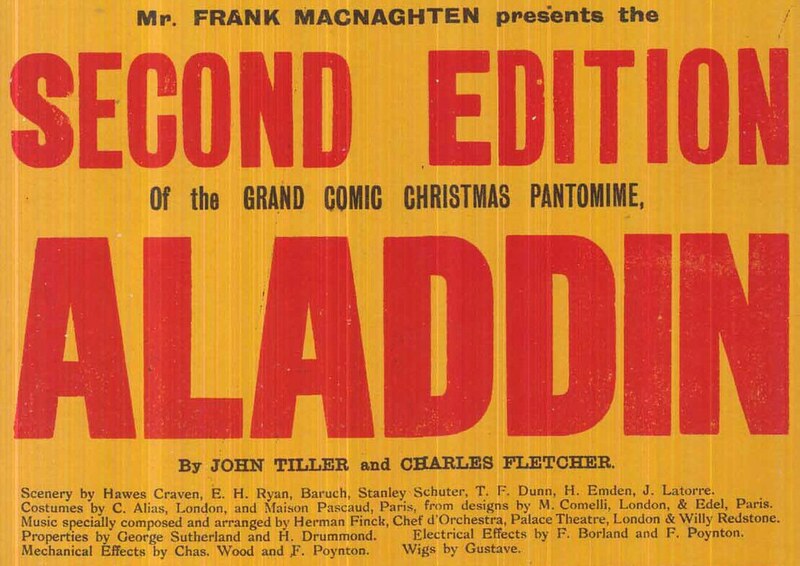 The 'Grand comic Christmas pantomime' of Aladdin was performed at the Theatre Royal in the 1890s. The golden age of Leeds panto in the late 18th/early 19th centuries saw productions that mixed extremely elaborate sets and costumes with bawdy humour and copious local in-jokes. 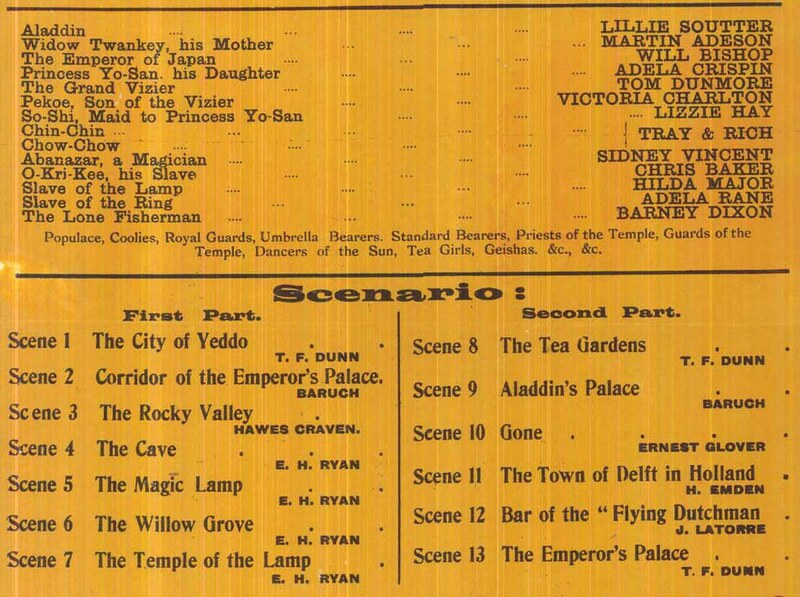 The comedic tone extended to making fun of other cultures, including the Chinese in this version of Aladdin (the script of which is held by Local and Family History at Leeds Central Library). Characters included magicians, princesses, slaves and fishermen, with an emphasis on silly names. Scenes took place in willow groves, palaces, temples and tea gardens. 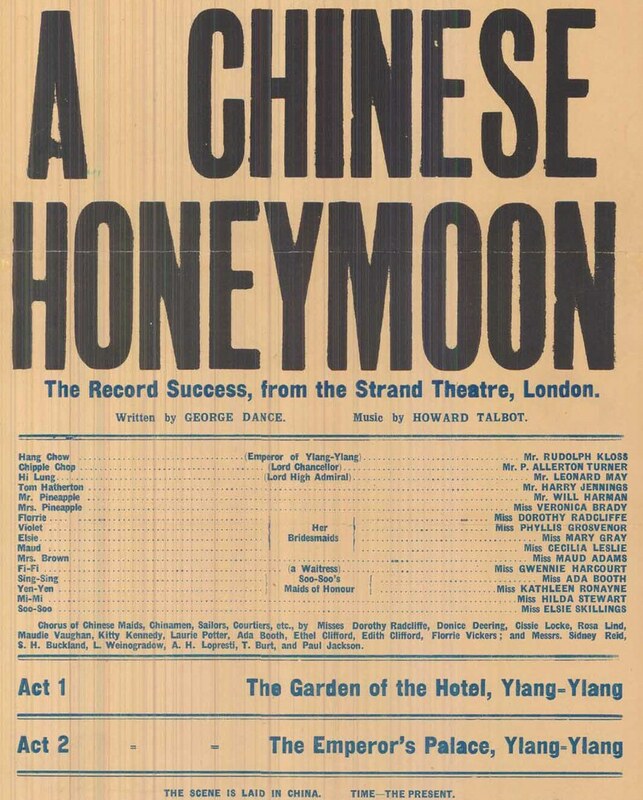 The 1908 production of A Chinese Honeymoon took place at the Grand Theatre. The comic story concerned English couples arrested for kissing while on honeymoon in China. 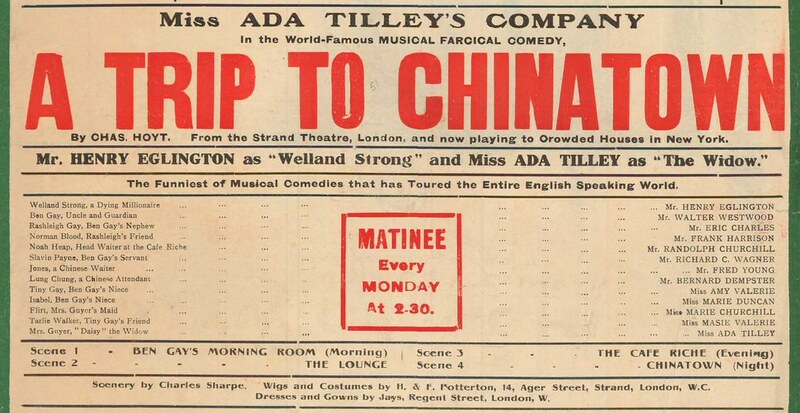 Modern China was seen as an exotic and humorous setting for light musicals performed in Leeds in the early 20th century. English characters would find themselves encountering cultural misunderstandings, pretty girls and stern authority figures. At the Grand Theatre in 1907, a Chinese comic opera with characters called 'Silky-Lips' and 'Forbidden Fruit'. 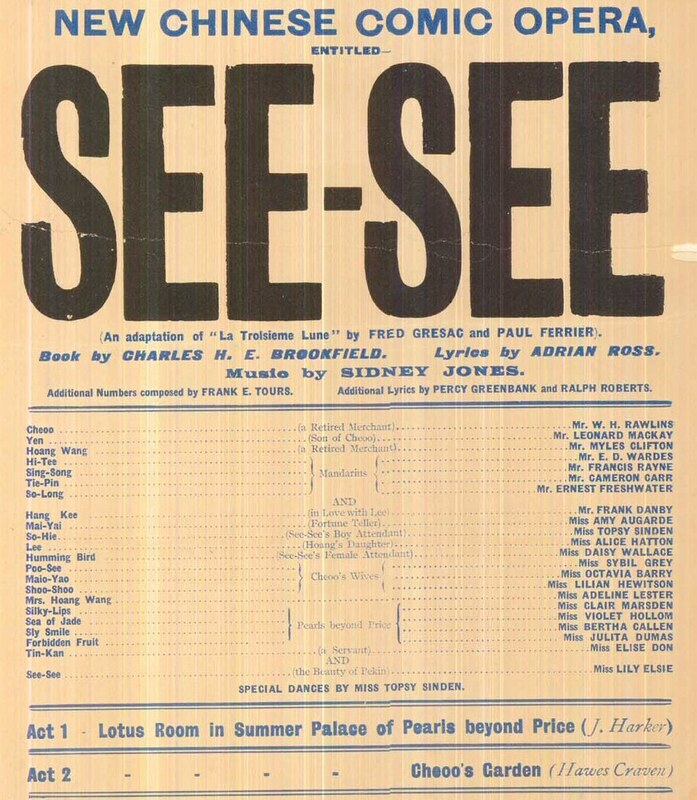 A 'Musical Farcical Comedy' performed at the Queen's Theatre and Palace of Varieties, Holbeck, in 1913.